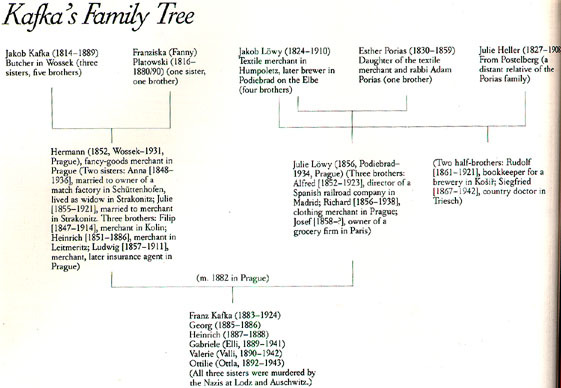 Franz Kafka's maternal grand-mother was born Esther Porias. She was the daughter of the textile merchant and rabbi Adam Porias. I. Kafka's father Son of butcher Jakob Kafka and his wife, Franziska Platowski, he was born and raised in Wossek, southern Bohemia. From 1882 on, he was a fancy-goods merchant in Prague. II. Julie Löwy (1856-1934) Kakfka's mother. Daughter of the textile merchant and brewer Jakob Löwy and his wife, Esther Porias, she was born and raised in Podiebrad on the Elbe. She married Hermann Kafka in 1882.
a textile merchant and brewer in Podiebrad.